You no longer need to sell food to get menus on your Google Maps or Google Local panel, now you just need to add your menu of services to your Google My Business "info" section and presto, you got your own menu. 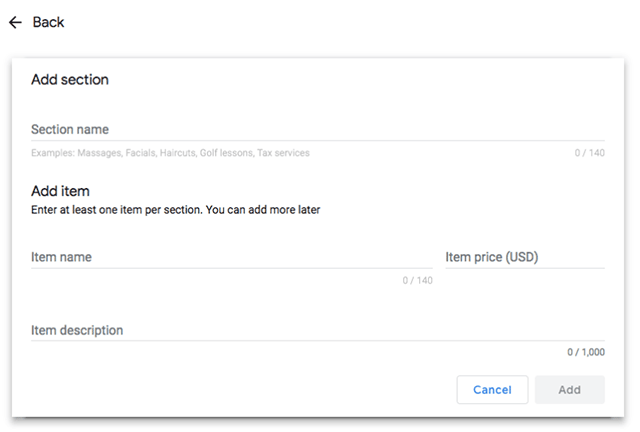 Businesses in health & beauty, and service businesses, such as plumbers and florists, now have the ability to add their menu of services directly to their listing through their Google My Business account. Same as the food establishment menu editor, this feature will only be available if the listing is not currently connected to a third party provider and for listings in English speaking locals. If your listing is currently displaying an incorrect menu, please see this help center link for more information on how to correct or remove the link. Here is that help document. The folks in the Local Search Forums are looking to see if there is a positive outcome to doing this action, if so, they will report back. Forum discussion at Local Search Forums, Google My Business Help and Twitter. Previous story: Google Rolling Out Featured Snippet Refinement Bubbles?